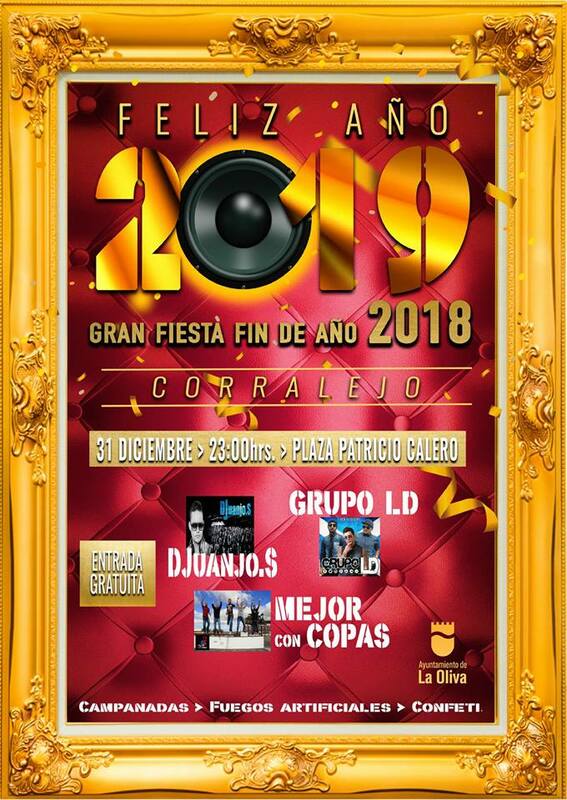 If you're planning on spending New Year's Eve in Fuerteventura this year, then you have to attend one of the many parties organized on the island. Most of the large tourist resorts in Fuerteventura - Corralejo, Caleta de Fuste and Morro Jable have New Year's parties each year, followed by fireworks to mark the event. Each year there is a big New Year's Eve Party in Corralejo in the main square Patricio Calero and this is the place to be at midnight. People are dancing and singing in the streets while waiting for the countdown before the new year. Most of the bars and restaurants in Corralejo are also open and hosting dinner parties, so you can join one on the spot. Special guests and performers this year are: DJ OANJO.S, Grupo LD, Grupo Mejor Con Copas. The New Year's Eve party in Caleta de Fuste is also usually organized in the main public square and features music, entertainment shows and fireworks at midnight. The fun and music will continue until 3:30 am and the authorities are inviting all tourists to come and enjoy the New Year celebration in El Castillo. If you're situated in the south of Fuerteventura, then you can attend the New Year's Eve party in Morro Jable. Live music, dancing and you will be on the right path to a great start for the new year. The party will be held in Tagoror park in Morro Jable. The bands performing are: Nuevo Klan, Grupa Acuarela and Grupo la Formula. The event in Morro Jable will start at 00:00 and a fireworks show is also on the schedule. On the 31st of December 2018, the entire island will be partying, dancing and drinking cava or chanpagne to welcome the New Year in Fuerteventura. Most restaurants will also have festive dinner parties with menus starting at 40-50 euro per person. If the weather is good we recommend you try one of the outdoor parties from Corralejo, Caleta de Fuste or Morro Jable. The entrance is free and everyone is singing and dancing together, in a typical Spanish atmosphere. New Year's Eve in Fuerteventura is a lovely time to visit the island, so you can enjoy the warm weather and also the festivities and the non stop party atmosphere.